The main message that has united both main party conferences over the last fortnight is that the era of austerity is over. For Labour that means more spending on new things – from universal childcare to a mass programme of nationalisation. And for many Conservatives it means a return to what they love doing best – cutting taxes. Leaving aside whether austerity is over yet, what both parties failed to acknowledge is that Britain is about to enter a more sobering new era – where we will all, firms and families, have to pay more taxes to preserve the status quo. It’s hardly a political rallying call but it can’t be ignored any longer. Here’s why. Back in 1947, Britain saw the first peak of the baby boom as one million babies were born. The post-war baby boom, of which I am one, helped to deliver a thirty-year run in which Britain had lots of workers with not so many pensioners ahead of them. This created a huge dividend for the Treasury, and plenty of room for tax cuts. But now we baby boomers are getting older – the babies of 1947 turned 70 last year. We are now entering a period when just maintaining the public services we already expect is going to cost more. By the end of the next decade the cost of the state pension, and the health and care provision we’ve already got, will rise by £24bn a year. By 2040 it will rise by £63bn. One way to meet this challenge is the ‘pacifist’ option – cutting other big areas of spending like defence. But frankly the pressure here is to spend more not less. Cutting the Overseas Aid budget does not meet the scale of the bill either. We could take the ‘mañana’ option and simply borrow the money. But since the crash the national debt has increased from around 40% to 80% of our national income. The mañana option would take it up to over 100% by 2040. It would be wholly irresponsible to dump these bills on our kids. Some on the right of politics advocate the ‘slasher’ option of privatising the state pension or introducing charges in the NHS. But abandoning the principle that healthcare is free at the point of use would be a dereliction of a promise politicians have made since the creation of the NHS. And the over-60s would be exempt from any new charges. But that is where the cost pressures are. So it would leave young people paying twice – for the public services for old people and private services for themselves. So we begin to face the uncomfortable truth that taxes are going to have to rise. We cannot avoid paying the bills for the boomers as they enter retirement. We have an obligation to older generations – indeed young people want their grand-parents to have a decent state pension and good NHS care. Politics is going to be very different. It will be about which taxes to put up as the baby boomers age. The classic option, taken by Chancellors before, is to raise taxes on income and consumption. 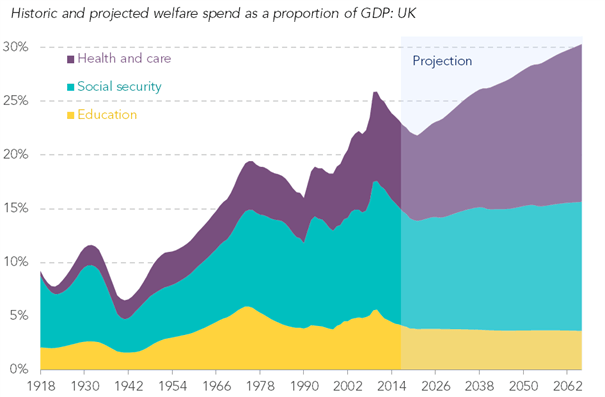 But funding those sorts spending pressures through income taxes alone would require a 15p increase in the basic rate by 2040 – a whopping tax rise borne entirely by our children and grandchildren. Instead we have to look at a fundamental change in our society – the value of what we own has shot up relative to what we earn. This surge in wealth, up from three times our national income a generation ago to seven times today, has been driven in large part by rising property prices. 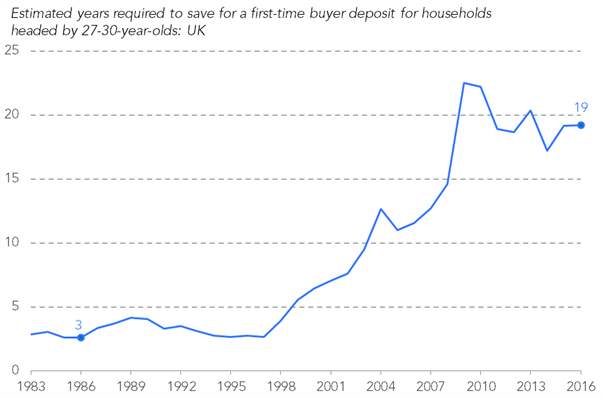 It is why it now takes 17 years to build up the deposit to buy a first home, not 3 years as it did in the 1990s. These high value assets belong by and large to the boomers who have the pensions and own the housing wealth. Indeed, one in six over 60s now own two homes. As parents we worry about how our kids are getting to get started on the housing ladder. Do we really want to expect our kids to pay higher taxes to fund our health care and social care? There are of course older people with low incomes and we must not increase the tax burden on them. But pensioners today are less likely to be poor than people of working age. So when we can afford it my generation need to make a contribution. And there is one obvious source – the wealth we are sitting on. To start with we should replace council tax, which is increasingly looking like the poll tax it replaced, and introduce a local property tax that reflects current house prices. We should also abolish the hated inheritance tax and replace it with a Lifetime Receipts Tax. This would end the punitive 40 per cent tax rates and prevent the super-rich from avoiding their obligations altogether. This is not done out of dislike of wealth or wealthy people. Collecting more from affluent boomers should not be done out of savage pleasure in taxing them. It is done reluctantly because the alternatives are worse ­– slashing the services that older people rely on, unaffordable high public borrowing, or taking Britain back to the 1970s in terms of the high income tax rates we’d be landing on kids and grandchildren. I and so many of my generation have done very well compared to young people today we cannot just turn to them to pay for our health and social care. I accept that I will need to pay more tax to help the younger generation. And I don’t think I’m alone. Higher taxes for maintaining the status quo doesn’t sound like the big change we all want. But it can be much more than that. This new approach can form the bedrock of a bigger move to build a better Britain, repairing our contract between generations with everyone, young and old, making a contribution and having a stake in society. If the Brexit referendum has taught us anything it is that a more united Britain is a prize worth fighting for.